The heart is a large muscle in the centre of the chest. Using a stethoscope, it is possible to listen to it, and to diagnose problems within it. The heart is a big old pump, that transports blood around the body, allowing it to be oxygenated in the lungs, and thus supply oxygen to the body. 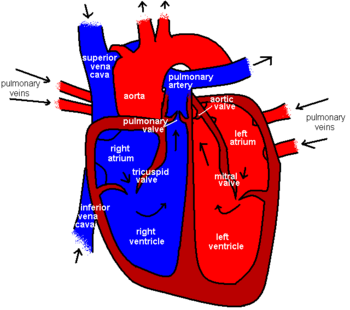 The contraction of the heart is synchronised using a complex conduction system. In the womb, there is a hole that allows blood to pass between the left and right sides of the heart. This closes at birth. For more information, read the page on the foramen ovale. It's time to take a trip over to the Cardiology section, and learn all about myocardial infarction, hypertension and Arrhythmias! Finding out about all the cardiac emergencies is a good idea too. This page was last modified on 19 March 2011, at 16:39.